We left for Sri Lanka on Saturday 19th April, all very excited to see what recent divers on the Hermes had been talking about. An 8-hour flight to Singapore, followed by a 3 hr flight to Colombo, and we had arrived in our destination country. We spent the night in a basic, yet comfortable hotel before waking to breakfast on the beach. We then began our 6-hour journey across Sri Lanka to Batticaloa, where the Hermes lies. We stopped for lunch and then visited an ancient Buddhist temple on the way, climbing many steps to reach its entrance. A very rewarding exercise. Back in the bus and we were on the road again heading to Batticaloa. Although the trip was long, it was quite interesting. It allowed us to see the day to day activities of the local Sri Lankan people. We also saw wild elephants, eagles and other animals along the way. What I found most interesting was the way in which the traffic merged with cyclists and pedestrians on the road. There was no clear cut median line. Traffic just overtook other cars, buses, trucks, cyclists when they wanted and oncoming traffic was forced to move to the side of the roads. Amazing how seamless it all occurred! Just after sunset, we arrived at the deep sea divers resort, our home for the next 6 nights. We dropped our bags and sat down to dinner, before then setting up our dive equipment for the first of our many dives to come. The next morning at 6 am we were up for coffee and an omelette breakfast. After our dive brief, we boarded our small 25hp boats and we were off to the Hermes. The boats are launched in a lagoon which has to pass over a sandbar into the Indian Ocean. Normally a trench is dug so that the boats can just pass through, but at the time we were there, the water level in the lagoon was low and they use this water for irrigation, so they did not want a direct opening where the lagoon water could flow out. This then meant the boats had to take a run up and launch themselves across the sandbar to get to the ocean on the other side. Quite an exciting thing to watch, especially to see if they could make it all the way across with just their momentum! A few of the local fisherman were paid to be on hand to help push when they didn’t. Back in the boats and we were off for our short journey (about 20 mins) to the wreck. A 10min zig zag with the GPS and the anchor was in! Gear on, buddy check, backwards roll and we were in! Diving the Hermes is notoriously known for its strong surface currents, and on this first dive it did not disappoint. A quick descent and bubble check and we were pulling ourselves down the line (45m) to the hull of the ship. At about 20m the current eased off. The plan on his dive was to explore the superstructure, visiting some of the shops main guns, artillery and lookout (crows nest). 25 mins later we were on our way back up again to complete about 45 mins of decompressing. I knew that the current on the anchor would be strong once we got back up to around 20m so we sent up a surface marker buoy (smb) so we could drift along without fighting the current and the boat could just follow us until it was time to surface. This was definitely the easiest thing to do. Once we had completed our allocated decompression we surfaced and headed back to shore. All with massive smiles on our faces. The Hermes definitely did not disappoint! ….. And the best was still yet to come. Once we returned to shore, we rinsed off our dive gear and sat down to lunch whilst our tanks were refilled. A quick nap, analysis of our nitrox tanks and we were back in the boats heading out for our 2nd dive of the day. On this dive, we all headed down the anchor line with the aim of exploring the bow section of the wreck. Our guide, Feli, led us down the port side of the wreck, pointing out the depth charges, line cutter bombs and then onto the chains leading up to the anchors. This was quite impressive as you can imagine. Anchors (of which there were 4) large enough to hold a 200m long aircraft carrier weighing over 400 tonnes! A few minutes later and we were heading up to complete the 2nd round of allocated decompression for the day. Once back on shore, we cleaned our gear, relaxed in the pool and talked about the cool things we had seen that day in the wreck. A few drinks after dinner and then it was off to bed! the next day we awoke and it was groundhog day once more!! On this, the third dive on the Hermes, Tad and I attempted a penetration inside to see some of the ships quarters and various amenities. We staged our decompression tanks at the entrance to our penetration point (finally getting to use the skills we had learnt during our tec training). As we attempted to enter through the first section of the wreck, I realized that this was going to be no easy feat, having brought my large camera system with me. I decided against the penetration, and we returned to collect our decompression tanks, where Kristy and Mike joined us and together we finished the remainder of our bottom time drifting over the hull of the wreck before ascending to complete our next round of decompression. On the next dive, Kristy and Tad decided to attempt the wreck penetration, whilst Mike and I ventured to the stern to check out the propellor and rear guns. I was overwhelmed with the fish life at the stern. 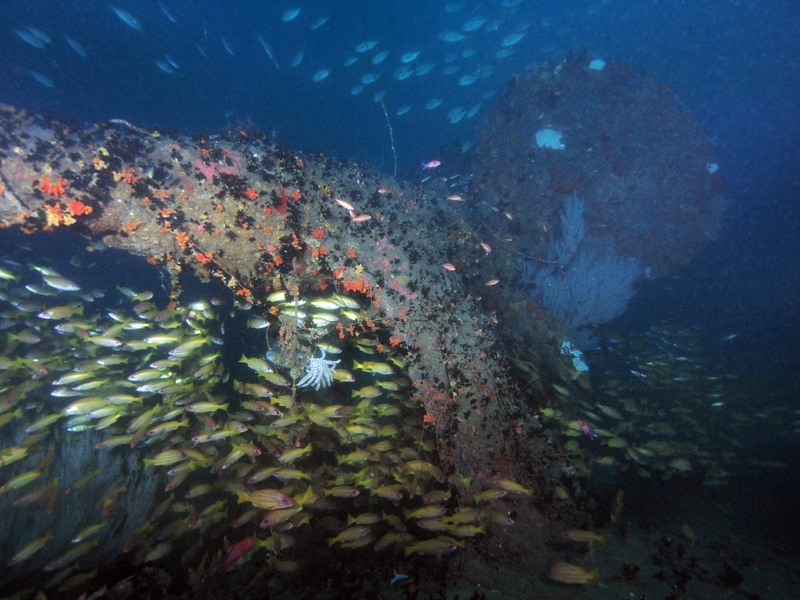 There was yellow lined snapper (as seen all across the hull of the wreck), along with a large school of snapper hanging out under the propellor. The occasional large tuna would cruise overhead, with large schools of jacks periodically buzzing us, sometimes for 2 minutes at a time! The rest of our dives went fairly similar to the previous ones, where we slowly saw more and more of the wreck and began to get a full appreciation of what we were diving. We saw the 2 large anchors again, still attached to the front of the wreck, along with many other large guns and artillery. I spent many more of the dives towards the rear the wreck as the marine life here was spectacular. Sea snakes, a large stingray, moray eels and other schools of fish among them. One of the most interesting things about the Hermes is the relatively unknown history behind its sinking and the location of its accompanying destroyer, the HMS Vampire – a 100m long first-class Australian destroyer that was also sunk by the Japanese aerial attack on the Hermes. After a little more study into the history of the sinking of the Hermes, we discovered, according to documented photographic footage that the Vampire may have in fact been sunk no more than a mere few hundred metres from where the Hermes currently rests! And other supporting evidence from local Fisherman may also prove this to be the case. With a little more information from the local fisherman, we attempted a dive where we believed the Vampire lay. Descending we were hopeful… but unfortunately, we found nothing more than sand. Fili has not given up hope of finding the Vampire and has vowed to spend more time and resource looking into its final resting spot. After 10 dives on the wreck of the Hermes, I thought I would be completely satisfied and ready to tick it off my list, but this is not the case. I will definitely be back to dive the Hermes again, and hopefully the Vampire along with it!! After packing up our gear, it was time for a quick lunch and then we were back on the bus for our trip back towards Colombo. We visited an Elephant Orphanage and another temple which was extremely impressive!! This trip would definitely go down as one of the most memorable I have done and one that I will never forget. Many thanks to Kristy Dean, Mike Wilcox, Tad Sarnicki, and Ela for being a part of it with me.